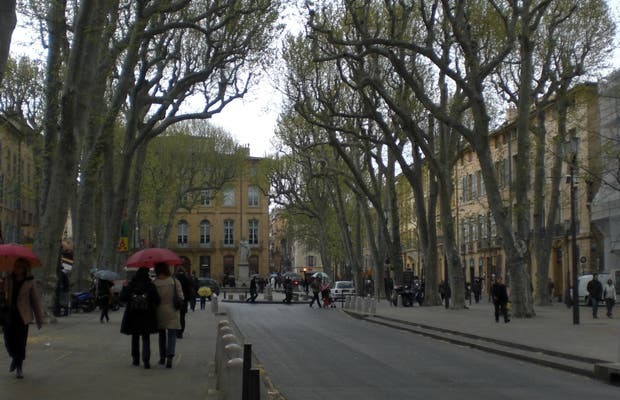 The Cours Mirabeau is the most prestigious avenue in Aix en Provence. It was built in 1649, where the medieval walls of the city once stood. It is famous for its four fountains and the trees growing in summertime give and amazing coolness to the place (it gets hot in Provence). It is a place for walking and, in fact, was once one of the gateways to the city. It was called (in Provençal) "The Path of the Floats" and was one of the more aristocratic and prestigious areas of the city. Most fashionable things was to have a house on the same avenue. The shops and trendy cafes in the 18th century were all located on this street.